In a bowl, beat the egg and stir in buttermilk. In a second bowl, combine flour, sugar, baking powder, baking soda and salt. Create a well in the center of the dry ingredients. 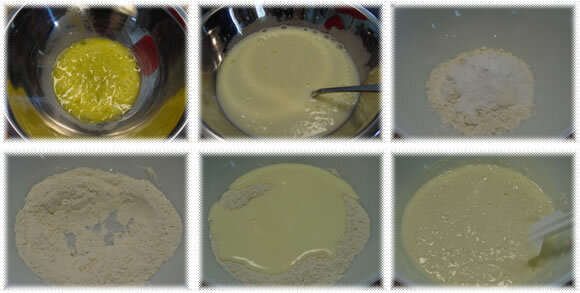 Pour in buttermilk-egg mixture. Stir just until combined and add vanilla. Batter will be lumpy. The less you stir your batter, the fluffier your pancakes will be. Melt butter over medium heat and add melted butter to to batter, stirring gently. Wipe excess butter from skillet or griddle. Adjust heat on the lower side of medium. Pour batter into pan by quarter-cupfuls. For smaller pancakes, use a smaller cup. When bubbles form on top it’s time to flip. This will take about 2-3 minutes. The bubbles will help your pancakes keep their shape during the flip. If bubbles haven’t formed, it is not time to flip. Keeping your pan hot, but on a lower temperature ensures your cake will cook through and not be raw on the inside. Total cooking time about 4-6 minutes per flapjack. Top with butter and syrup and enjoy. Makes 8-10 pancakes. Recipe doubles well. Leftovers freeze well for a microwave breakfast in minutes! Link to the Flap Jacked video. Link to the accompanying Flap Jacked blog post. 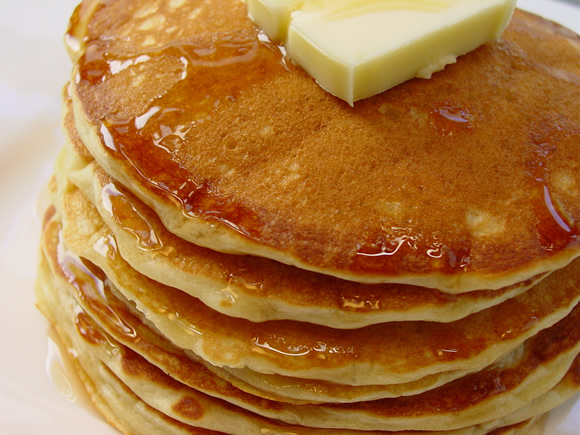 yumm i could use some good ol’ flapjacks right now! These look so good! Thanks for sharing! Thanks for the step by step! 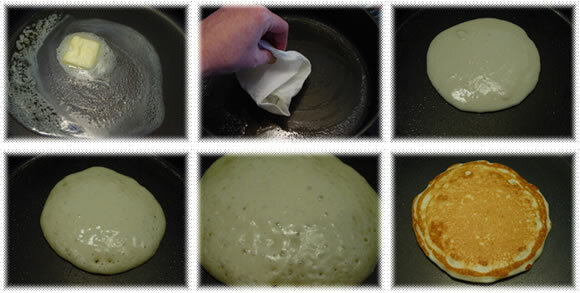 Now I know what I always do wrong with pancakes…using too much batter for each one. How big do you make your Flaps, are they quiet meaty?! I would just like to thank Sue for asking that question I have often wondered why my flaps are smaller then my friends? I would also like to add some sausage to my Flaps so they turn into a nice meaty flap. Any ideas on what type of meat I should use? Not sure what Betty thinks? but I thought Salami or Prawns would go quiet nicely with the Flaps. I’m wondering if you ladies know Holly? Row, I’ve never added sausage or bacon directly to the batter… but I imagine the meat should be well drained of any excess grease so as not to interfere with the moisture content of the batter. Here in the US people (usually) enjoy flapjacks with the meat on the side rather than in the flapjack. Many people enjoy adding blueberries or chocolate chips to their flapjacks. If you’d like to try either of these additions, pour the batter into the skillet as you normally would and add a few berries or chips to the flapjack before flipping. If I was adding meat to the flapjack, I would add it in this same manner. Oh! Cereal? I never thought about that addition! I bet that makes for a crunchy breakfast treat and meal all in one flapjack! I did a little Googling for “fish cake recipe” and found a few. None of them that I liked enough to link to. I also searched around for a “crab cake recipe” because you could just substitute the crab for fish. Didn’t really find a recipe that got me excited either. To me, a great fish cake (or fish flap) would be spicy with either a Chinese/Sichuan vibe or a more American version with a roasted red pepper aioli. I’d start by poaching your desired fish in a flavorful broth. Allow to cool. Then, flake the fish and combine with an egg, some green onion, garlic and any other seasonings you desire. Form the mixture into patties with either a panko breadcrumb, Italian breadcrumb or flour. I’d allow the formed cakes to rest in the refrigerator to firm them up a bit. Then, in a hot skillet with about 1/2 inch of oil, fry the fish cakes until golden and crisp on each side. Drain excess oil by setting on paper towels. For the Sichuan flavor, I’d serve them with fresh lime wedges and a dipping sauce of ginger, garlic, cilantro, soy sauce, sesame oil, rice vinegar, honey and chili oil or paste for some kick. Do you think this wonderful recipe could work with normal milk instead of buttermilk? BUT the buttermilk imparts such a different yumminess, I wouldn’t want you to miss out! Buttermilk has a somewhat sour flavor that really adds complexity to the taste of the sweet, buttery pancake. You can “make” buttermilk by mixing 1 tbsp white vinegar or lemon juice per 1 cup milk. I haven’t done this myself, but many people say it works! Recently, I craved these flapjacks but only had 3/4 cup of buttermilk, so for the rest of the liquid I mixed milk and sour cream… and the flapjacks were delicious. If hope you try my recipe, and I’d love to know what you think. I love pancakes, I like to add a little extra oil to the griddle for that nice crispy edge. I really like banana pancakes! This was a great recipe. I woke up this morning craving for flapjacks and began googling for recipes and I found your site! The step by step intsructions were great! I followed them exactly except I only had whole milk yet it still turned out delicious! I live in Sri Lanka, and we usually do this. We call it “kiri(milk) roti”. We have them with mix vegetable curry and Spicy Tempered onion sambal(SEENI SAMBOL). And sometimes we add potatoes or other vegetables to kiri roti(pancake). hi Betty! I’m new to the blog but i must say you have some wonderful recipes here! what a find! Have fun making the pancakes and let me know what you think! Flapjacks are oats, syrup, butter and demerara sugar, all tossed into a frying pan. Melt it up and fold it all together, then layer into a baking tray about an inch deep and bake for about 30 minutes. Allow to cool and you have flapjacks. You see the difference? P.S. I only found this site via youtube when clicking on a link in the cupcake atm video so I am also new to the site. 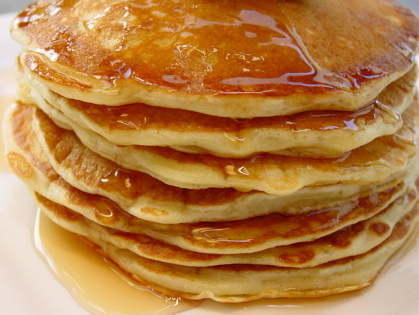 Oh, and I must try your pancake recipe, have always wanted to try cooking American style pancakes. And one more thing – instead of butter and syrup, try sprinkling sugar and lemon juice over your pancakes – absolutely yummy. Another thing – can I make them without the buttermilk or is that a necessary ingredient? Oh wow (sorry, last comment, haha), just saw your Facebook link and sent a request, but noticed you’re in Tampa. I have a couple of old school friends who got married, had kids and moved to Tampa a few years back, how cool! 1. Place a Tablespoon of white vinegar or lemon juice in a liquid measuring cup. 2. Add enough milk to bring the liquid up to the one-cup line. 3. Let stand for five minute. Then, use as much as your recipe calls for. Thanks for telling me how you arrived here ;) Thanks goodness for Cupcake ATMs! LOL — This recipe was originally called Flapjacks because we made a video (a satirical cooking video + sketch comedy) that was about the economy… Hard to explain, but here in the US a flapjack is pretty much just the southern version of a pancake… more like slang for a pancake than a different creation.